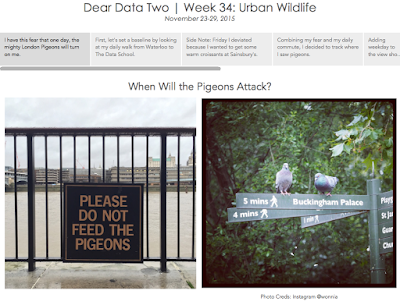 As soon as I saw the topic for this week, I knew exactly what I wanted to track...the ever present London Pigeon. He/she is mean as hell and one day I'm convinced we'll all be attacked by them. 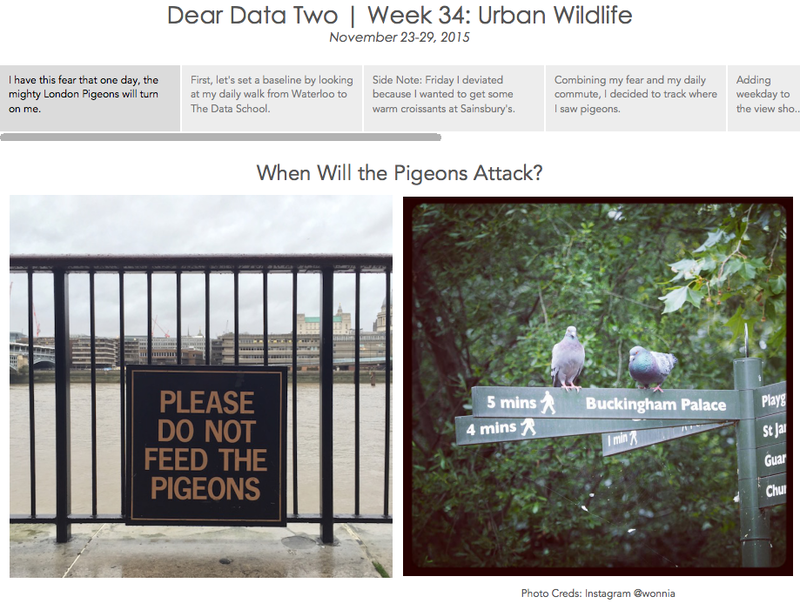 I tracked them all week, but for the postcard, I focused on my daily walk between Waterloo Station and The Data School. The pigeons scare the daylights out of me, but this week, I decided to note every time and place that I saw a pigeon and how they reacted to me. One interesting thing I found is that they only seem to be prevalent during the day; I only saw one all week in the evening. After plotting them on a map, I decided to copy what one of Jeff's students did in class: create a map overlay. The postcard itself only plots the pigeon sighting (which I really like how it turned out), whereas if you add the map overlay, you then see the locations of the pigeon sighting. Great idea from UoC! !